I know everyone is gearing up for Thanksgiving. Perhaps you should take a break from the extensive cooking today and have tacos. 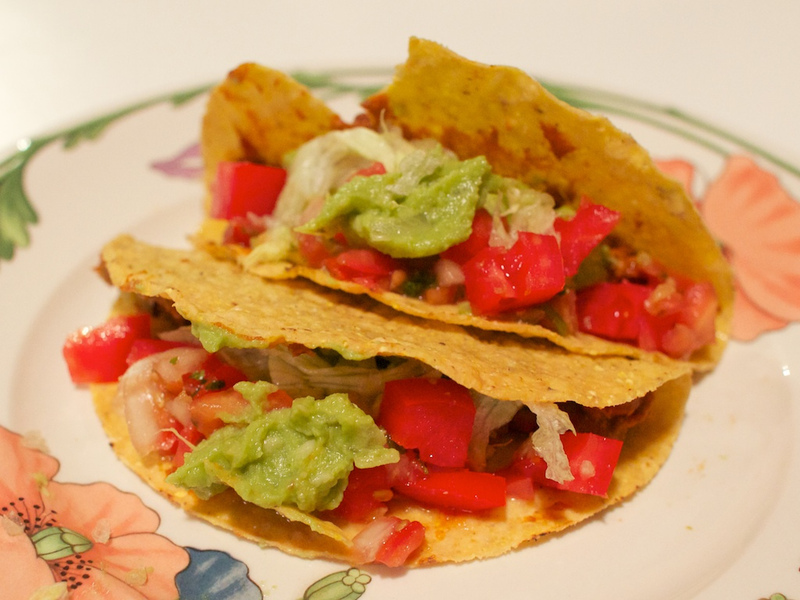 Tacos are one of the easiest things to make and highly delicious. They’re as simple or complex as you want them to be. Here are the ingredients for a winning taco night. Basically all you have to do is heat up the “meaty” filling of your choice and the beans, toast your taco shells and pile everything in there. Easy, right? I mix the beans, crumbles, taco seasoning & soy chorizo all together in one pan. It’s great that way. You could totally be fancy and make your own salsa or guacamole even. Or you can just buy some pre-made stuff from the store. It’s pretty awesome no matter what you do. What your favorite way to make tacos? i always use morningstar farms crumbles and add a bit of salsa to it while it cooks… makes it taste like taco bell, yummmmm. I love taco night! Happens all the time in my house. I think that’s why my boyfriend keeps me around. He’s an honorary Mexican for sure. I usually marinate gardein beef or chicken strips in lime juice with garlic, cumin, paprika, coriander, onions, jalapeno and cilantro. I basically use my dad’s recipe for carne asada. It is pretty damn convincing I must say. Almost borderline creepy. My Mexican parents approve! If I’m in the mood for gringo-esque tacos I usually rehydrate TVP granules and season them up with cumin & other spices. Taco Bell style (*cringe*), I know. But pretty tasty.